I blogged these guys back in November when they had a stall at the Sunday Upmarket on Brick Lane. 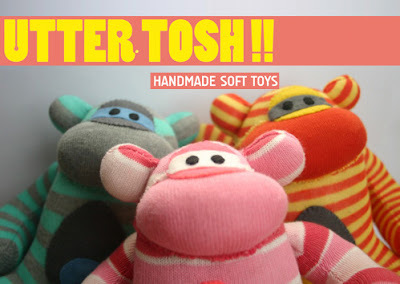 Utter Tosh have now finished up at the Upmarket and have opened an online store selling these super cute handmade sock-monkey plush toys. The toys are all completely hand-sewn and entirely unique, with each coming with their own names and things they like such as Handgliding and Hip Hop!!! Get em quick, as these guys completly sold out of monkeys at the Upmarket over the Christmas period.